The perfect way to warm up after a morning full of digging out, making snowmen and building igloos. Living in Boston during a snowstorm can be pretty ridiculous. Parking bans (where do you suppose we put all of these cars?! ), digging your car out after the snow plow comes down your street and encases your car in snow and ice (make sure you leave your wipers up so you can actually find the darn car the next day! ), going to the local bar because there is literally nowhere else to go, praying for your life when you have to walk on the street instead of the sidewalk because there is no sidewalk, and then of course the constant dread that as soon as you leave, someone will take your perfectly dug out parking spot. Even with a full dining set in your space, as I have seen before, people still steal spots. I personally don't dare take someones spot for fear a crazy Bostonian will key my car, slash the tires and put bologna on the hood. So after the stress of dealing with that, I need something to warm me up. This is absolutely the best thing ever. 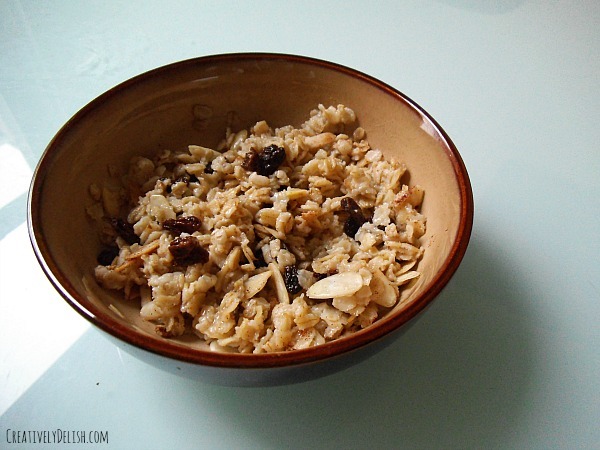 Raisins, sliced almonds, cinnamon and raw honey make this oatmeal out of this world. I also love to chop up an apple and use maple syrup instead of honey. It's a great escape from the arctic vortex going on outside. 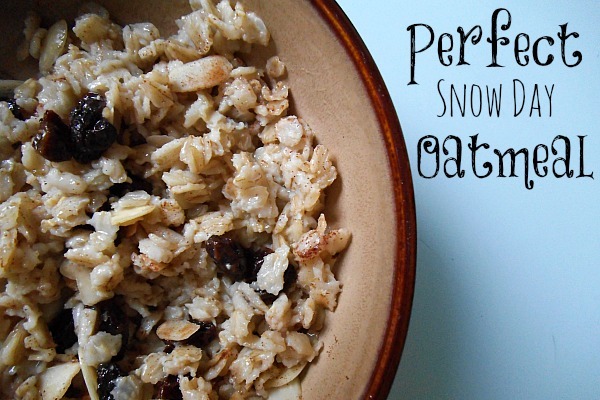 It's a quick, easy and delicious breakfast, full of nutritional goodness and just a little reminder to take good care of yourself and enjoy your snow day! Love love love your recipes! Would there be a way to include calorie and nutrition info? Thank you so much, I’m so happy you like everything! I am working on a calorie count for the recipes, but in the meantime I can at least tell you that this oatmeal recipe is 293 calories, 5g fat, 7g fiber, 6.3g protein, 5.7g sodium and 52g carbs. I tend to eat most of my carbs in the morning but if you prefer a lower amount of carbs, leave out either the honey or the raisins – both give it a good kick of sugar as it is so having one without the other will still taste delicious! Thank you for writing back Lauren and for the info! I made your spinach meatballs and spaghetti sauce last night and they were a HUGE hit! So happy I found your site..actually my son told me about it. My son is dating your fiancé cousin Kelsey! Keep those delicious recipes coming !